On the 27 th of June this year, Regardt van den Bergh was awarded the Medal of Honor for television from the South African Academy of Arts and Sciences. 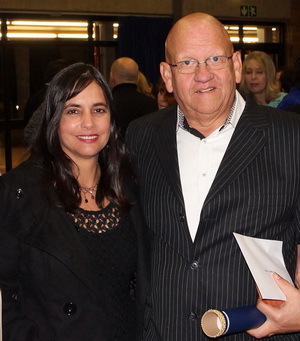 He was lauded for his outstanding and innovative work on the popular television series "Vloeksteen". In his acceptance speech he thanked his wife, Clara, for her inspiration (pictures to his left) the producer Herman Binge, and the wonderful opportunity the Kyknet channel afforded him. The Lamb is a heartwarming story of a Jewish father, Mattias, and his young son, Joel. Mattias is an intensely religious man whose life is shattered by the death of his eldest son, Aaron. Driven by grief and anger, Mattias renounces God and turns his back on the family he once treasured. The Hansie Movie will be released in North America on the 21st August, 2012. In North America the movie is called "Journey to Grace: The Hansie Cronje Story". It is available on pre-order from most Christian bookstores and their online websites. It will be in availble in-store beginning August 21, 2012. Kalossie - Movies for Life is excited and proud to announce that these innovative characters and their stories are to be introduced to audiences in December 2011! The first of the Kalossie DVD series comprises of six short stories, each addressing a particular biblical truth set in the bright and brilliant Kalossie universe. Walk the Talk is the testimony of a broken man who desperately searches for the good news of redemptive love. A young cast and crew helped Regardt van den Bergh to create this short story for the purpose of getting the message of Jesus out to the world. The series of short films of which Walk the Talk is the first can be used as material for discussion groups, outreaches and entertainment. 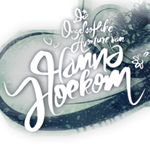 Regardt's new film, The Incredible Adventures of Hanna Hoekom, ranked 4th and 5th respectively in Heat's Top 10 films to see two weeks in a row! This coming of age South African drama is filled with love, alughter and magical realism as Hanna tries to make senseof her eccentric family. Based on Marita van der Vyver's work, this film was made in three weeks on loncation with the help of some state-of-th-art special effects. The 7th Annual Angel Film Awards took place in Monte Carlo December 3rd - 6th, 2009. The Angel Film Awards is a celebration of non violent films. Tornado and the Kalahari Horse Whisperer walked away with a total of 6 awards in the 2009 Feature Film category. South African film director, Regardt van den Bergh, was awarded the special Ischia Global Award for his ‘extraordinary films and contribution to the art industry’ at the seventh Annual Ischia Global Film & Music Fest. Van den Bergh’s latest film based on a true story shot in the Kalahari - Tornado and the Kalahari Horse Whisperer - was showcased at the event. This year’s Ischia Film and Music Fest will be dedicated to South African art and cinema. Regardt’s award is to be recognised among the most reputable international stars of the big screen. Among the talent who participated in previous years include 27 Oscar© winners. Some of the most notable names include: *Directors: Francis Ford Coppola; Norman Jewison; Neil Jordan; Oliver Stone; Bille August; and Giuseppe Tornatore. Actors: Hilary Swank; Sir Ben Kingsley; Vanessa Redgrave; Matt Dillon; Naomi Watts; Gael Garcia Bernal; Diane Kruger; Gerard Butler; Claire Danes; F. Murray Abraham; Rosario Dawson; Dennis Hopper; Brenda Blethym; Joseph Fiennes; Kim Cattral; Freddie Highmore; Val Kilmer; and many more. The ceremony was chaired by the Academy Award-winning director, Paul Haggis, while the multi-talented Hollywood manager Jason Weinberg serving as Master of Ceremonies. Producer, Mark Canton was on the top of the Honorary Board with some of the incredible talents who have been attending the festival in the past six years. The awards ceremony took place on 12 July on the Isle of Ischia, Italy.